Much more than just selling equipment, Universal Motion Inc. (UMI) desires to meet the needs of its customers. With this purpose in mind, UMI does its best to understand their problems and present the maximum number possible of solutions. Universal Motion Inc. staff is highly concerned about the equipment application, norms and procedures to be followed, types of tests, operation of machine etc., in order to guarantee its customer's satisfaction with equipment and services. A Universal Testing Machine or Universal Tester is a kind of equipment that are utilized in testing various properties of materials such as tensile, compressive ness etc. This machine has capability to test all mechanical properties of any kind of materials including compression, tension, bending etc. 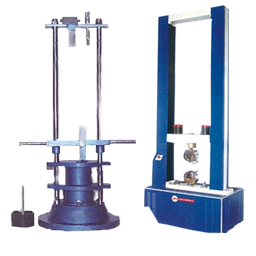 These machines are of different types which are required depending upon the output like Electro-Mechanical, analog, digital, electronic, computerized, servo control & hydraulic testing machines with highest 120 ton capacity. Load frame - Normally it consists of two strong supports for the machine but some small machines have only single support. Load cell - Load cell is required for a force transducer or other means of measuring. Cross head - A movable cross head (crosshead) is required to be controlled to move up or down. Normally this is at a constant speed; sometimes called a constant rate of extension (CRE) machine. There some machines such as electromechanical and servo-hydraulic are can program the crosshead speed or conduct cyclical testing and testing at constant force etc. Means of measuring deformation or extension - Extensometers are generally utilized to measure the response of test specimen since it needs many tests to measure the movement of the cross head. Output device - A medium to show the output of test results is always required. Some machines which are very old have digital display or chart recorder but the latest upcoming machines have computer interface to analyze and print the results. Conditioning - Some tests need the controlled conditioning such as temperature, pressure or humidity should be in control. Our machine should be placed in a room where the environment is in full control or any other special environment friendly chamber need to be kept near the test specimen. Test Methods - Test fixtures, specimen holding jaws, and related sample making equipment are called test methods. 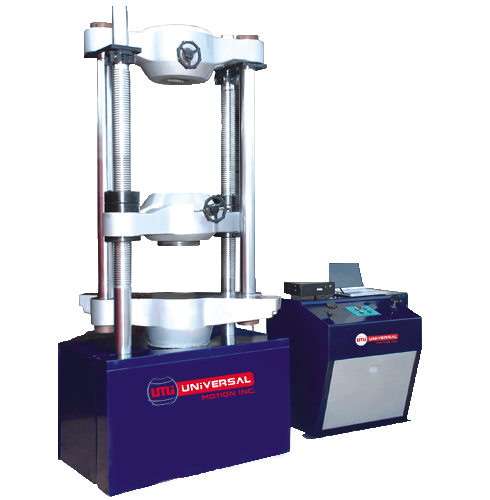 Universal Motion Inc. (UMI) provides 120 Ton capacity Universal Testing Machine or Material Testing Machine that are utilized in performing various tests on the materials including metal, plastic, asbestos, leather, paper and in rubber industries. It offers accurate reading because of its large size with controlled design. It is having simple control system to give safe and easy operation. Computerized Universal Testing machine offers window based software which gives analyzed report. It can perform many types of test such as in tensile, compression, bending and many other. Digital Universal Testing Machine provides easy data entry system through wrapped casing type Keyboard. It also helps the customer to print diverse graphic report. It can easily be upgraded instead of any major changes in hardware. We as Universal Motion Inc. is well known & famous universal testing machine manufacturers, suppliers, exporters in India having situated in Pune. We use highly advanced machines, modern innovative equipment in manufacturing and design of our products. With our vast technical knowledge & experience in this domain, we have been successfully catering the diverse need & specifications of our clients. We have a team of highly experienced technical experts who test these machines thoroughly on various strict industrial parameters to maintain its highest standards. We provide various types of these machines including Electro-Mechanical, analog, digital, electronic, computerized, servo control & hydraulic universal testing machines throughout India & across the world.